1. 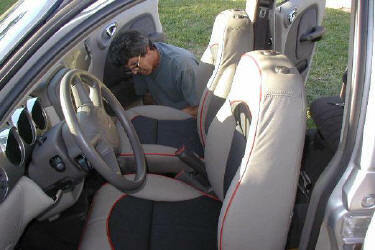 Front Seats: The biggest surprise is that you DO NOT remove the front seats from the car. 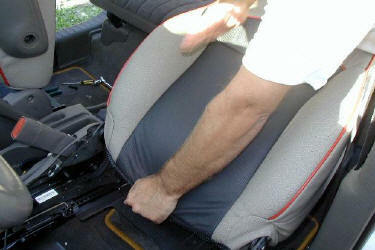 You will remove the cushion pans from the frames, but the front seats stay in the car. 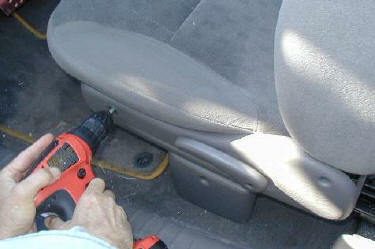 (Of course you can unbolt the front seats if you wish, but it's not necessary). A. 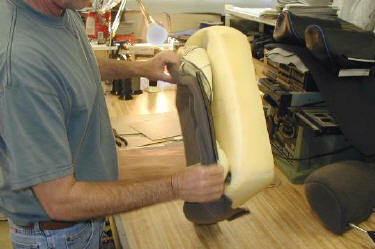 Remove the arms & headrests, remove the cushion pans, and peel off the backrest upholstery. B. 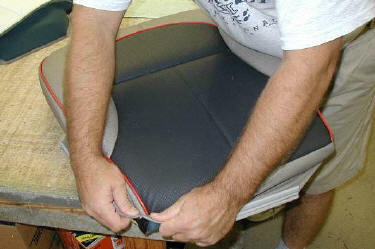 Install the new backrest leather in the car, install the cushion and headrest leather out of the car. 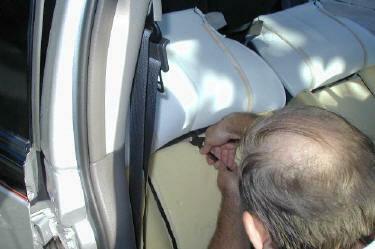 C. Re-install the arms, headrests, and cushion pans. 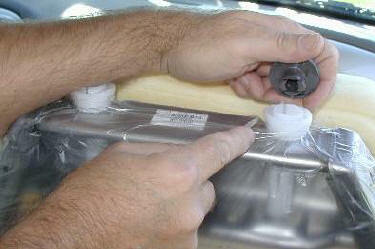 Remove the arms by pulling out the cap and remove the bolt with a Torx 45 bit. 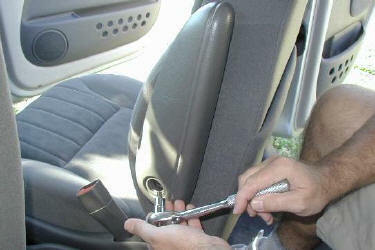 Remove the screws holding on the seat track covers. 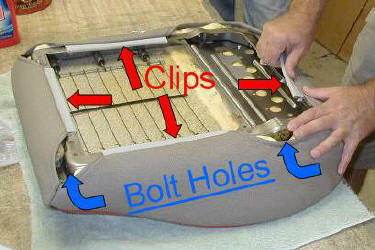 Remove the 4 bolts holding the cushion pan. These are 10 mm bolts. and 2 in the rear pointing frontward. 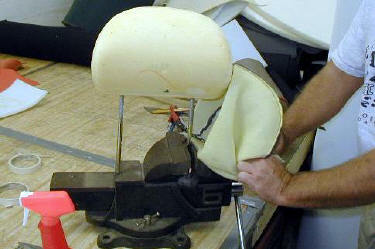 Seat-Cable runs through cushion pan. 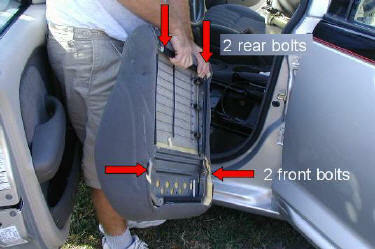 The 4 bolts hold the pan to the frame. 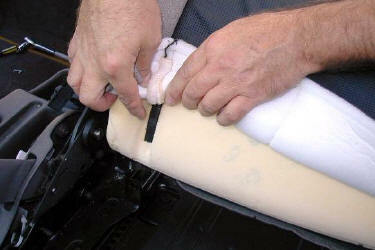 and remove the old hog-rings. hog-ring on in the original manner. 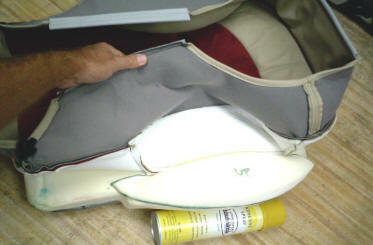 Glue on the "Bolster Booster" foam pads. 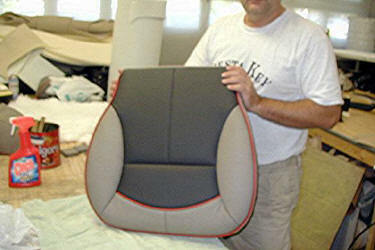 and give the seat a deeper look. Roll the 4 corners on. to leave the bolt holes exposed. The new leather is on and ready to go. 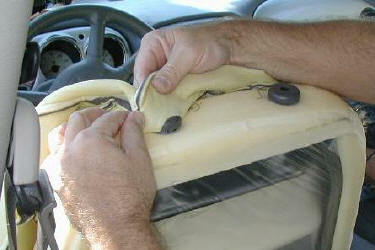 and peel off the old upholstery. 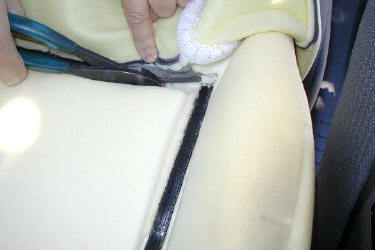 Cut a slit in the foam at the bottom. Stuff a vacuum cleaner hose into the foam. The vacuum will squish down the foam. Help it by pushing down on the foam. slide on the new leather. Cut away the excess plastic bag. 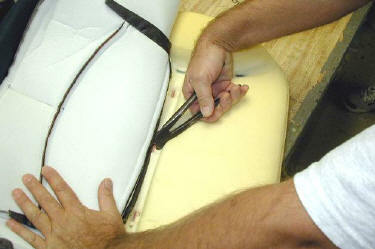 Align and tuck in the flaps. Place the clips between the metal bars. un-screw the trays and release the clips. 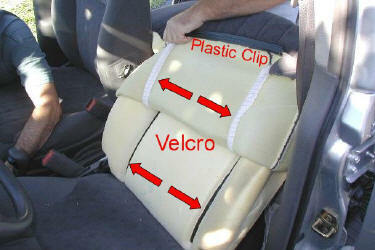 Pull off the old upholstery, it is held on with Velcro. remove these 3 old hog-rings. 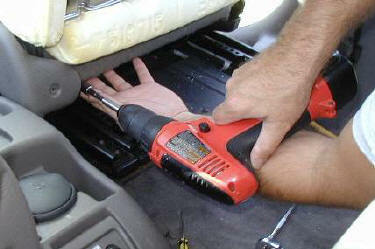 Twist with side cutter pliers (included). 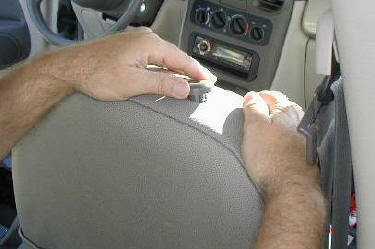 and slip it over the headrest clips. Pop off the headrest clips. slide it down half way. Hog-ring it on in the original manner. Roll the new leather down. Put the Velcro in the right place. and "Karate Chop" the Velcro so it sticks. Bolt the cushion pan back onto the frame. 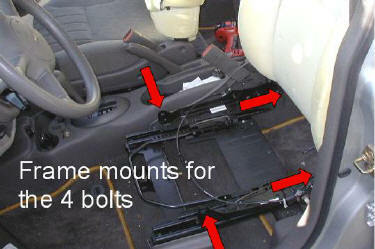 replace the side track covers. 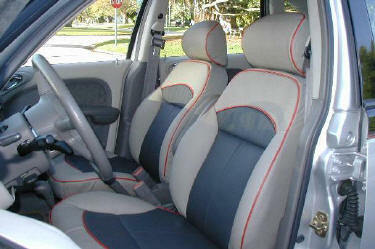 The Rear Seat is similar.